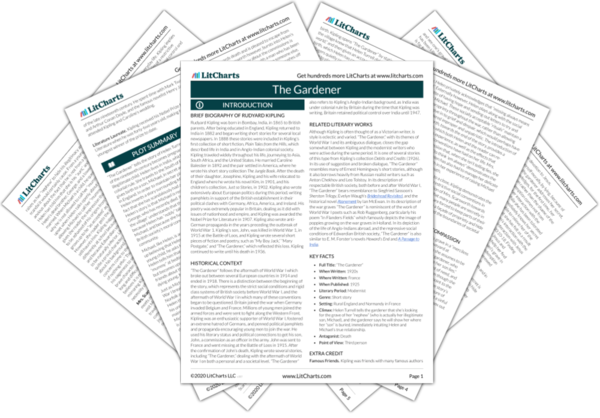 Instant downloads of all 946 LitChart PDFs (including The Gardener). 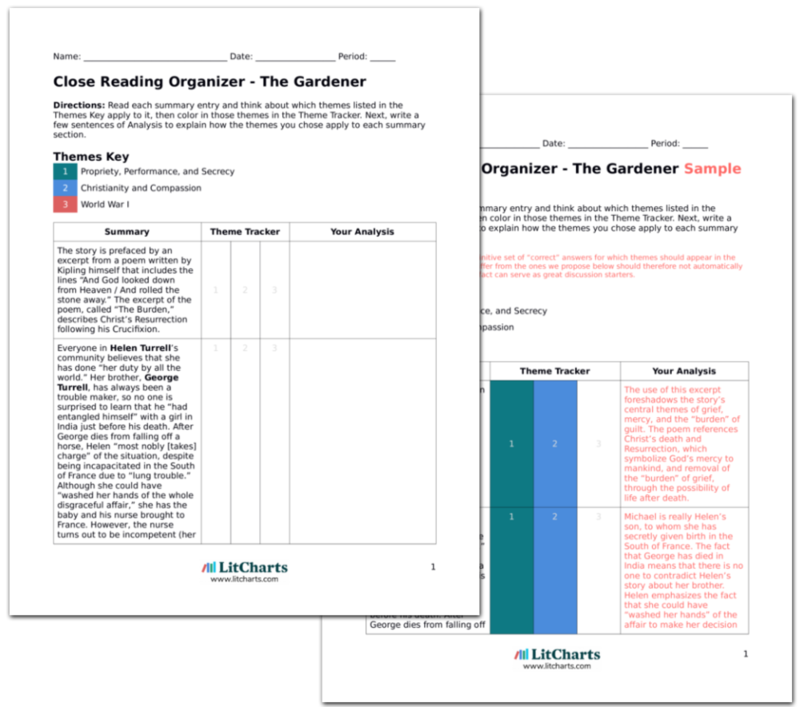 Welcome to the LitCharts study guide on Rudyard Kipling's The Gardener. Created by the original team behind SparkNotes, LitCharts are the world's best literature guides. A concise biography of Rudyard Kipling plus historical and literary context for The Gardener. A quick-reference summary: The Gardener on a single page. In-depth summary and analysis of every of The Gardener. Visual theme-tracking, too. Explanations, analysis, and visualizations of The Gardener's themes. The Gardener's important quotes, sortable by theme, character, or . Description, analysis, and timelines for The Gardener's characters. Explanations of The Gardener's symbols, and tracking of where they appear. An interactive data visualization of The Gardener's plot and themes. Rudyard Kipling was born in Bombay, India, in 1865 to British parents. After being educated in England, Kipling returned to India in 1882 and began writing short stories for several local newspapers. In 1888 these stories were included in Kipling’s first collection of short fiction, Plain Tales from the Hills, which described life in India and in Anglo-Indian colonial society. Kipling traveled widely throughout his life, journeying to Asia, South Africa, and the United States. He married Caroline Balestier in 1892 and the pair settled in America, where he wrote his short story collection The Jungle Book. After the death of their daughter, Josephine, Kipling and his wife relocated to England where he wrote his novel Kim, in 1901, and his children’s collection, Just so Stories, in 1902. Kipling also wrote extensively about European politics during this period, writing pamphlets in support of the British establishment in their political clashes with Germany, Africa, America, and Ireland. His poetry was extremely popular in Britain, dealing as it did with issues of nationhood and empire, and Kipling was awarded the Nobel Prize for Literature in 1907. Kipling also wrote anti-German propaganda in the years preceding the outbreak of World War 1. Kipling’s son, John, was killed in World War 1, in 1915 at the Battle of Loos, and Kipling wrote several short pieces of fiction and poetry, such as “My Boy Jack,” “Mary Postgate,” and “The Gardener,” which reflected this loss. Kipling continued to write until his death in 1936. 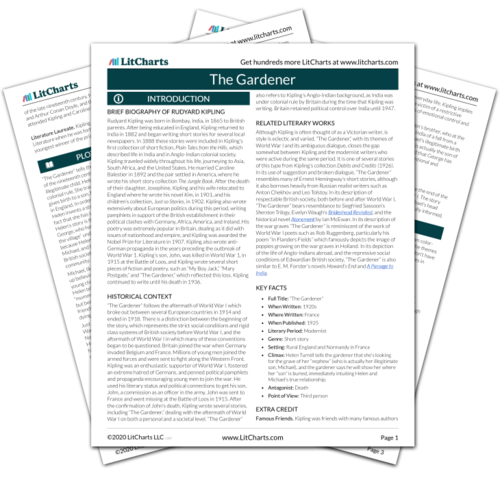 Get the entire The Gardener LitChart as a printable PDF. “The Gardener” follows the aftermath of World War I which broke out between several European countries in 1914 and ended in 1918. There is a distinction between the beginning of the story, which represents the strict social conditions and rigid class systems of British society before World War I, and the aftermath of World War I in which many of these conventions began to be questioned. Britain joined the war when Germany invaded Belgium and France. Millions of young men joined the armed forces and were sent to fight along the Western Front. Kipling was an enthusiastic supporter of World War I, fostered an extreme hatred of Germans, and penned political pamphlets and propaganda encouraging young men to join the war. He used his literary status and political connections to get his son, John, a commission as an officer in the army. John was sent to France and went missing at the Battle of Loos in 1915. After the confirmation of John’s death, Kipling wrote several stories, including “The Gardener,” dealing with the aftermath of World War I on both a personal and a societal level. “The Gardener” also refers to Kipling’s Anglo-Indian background, as India was under colonial rule by Britain during the time that Kipling was writing. Britain retained political control over India until 1947. Although Kipling is often thought of as a Victorian writer, is style is eclectic and varied. “The Gardener,” with its themes of World War I and its ambiguous dialogue, closes the gap somewhat between Kipling and the modernist writers who were active during the same period. It is one of several stories of this type from Kipling’s collection Debits and Credits (1926). In its use of suggestion and broken dialogue, “The Gardener” resembles many of Ernest Hemingway’s short stories, although it also borrows heavily from Russian realist writers such as Anton Chekhov and Leo Tolstoy. In its description of respectable British society, both before and after World War I, “The Gardener” bears resemblance to Siegfried Sassoon’s Sherston Trilogy, Evelyn Waugh’s Brideshead Revisited, and the historical novel Atonement by Ian McEwan. In its description of the war graves “The Gardener” is reminiscent of the work of World War I poets such as Rob Ruggenberg, particularly his poem “In Flanders Fields” which famously depicts the image of poppies growing on the war graves in Holland. In its depiction of the life of Anglo-Indians abroad, and the repressive social conditions of Edwardian British society, “The Gardener” is also similar to E. M. Forster’s novels Howard’s End and A Passage to India. Climax: Helen Turrell tells the gardener that she’s looking for the grave of her “nephew” (who is actually her illegitimate son, Michael), and the gardener says he will show her where her “son” is buried, immediately intuiting Helen and Michael’s true relationship. Famous Friends. Kipling was friends with many famous authors of the late nineteenth century. He spent time with Mark Twain and Arthur Conan Doyle, and the famous novelist Henry James attended Kipling and Caroline’s wedding. Literature Laureate. Kipling received his Nobel Prize for Literature when he was forty-two years old, making him the youngest winner of the prize to date. Greenall, Lily. "The Gardener." LitCharts. LitCharts LLC, 28 Nov 2018. Web. 11 Dec 2018. Greenall, Lily. "The Gardener." LitCharts LLC, November 28, 2018. Retrieved December 11, 2018. https://www.litcharts.com/lit/the-gardener.